By developing the quality of discrimination, a power solely accorded to man, can one distinguish between the eternal and the temporal, which in turn opens the gateway to peace and happiness. Vivekachudamani, literally translated as the ‘Crest Jewel of Discrimination’ is a compendium of 581 verses on the ways to know, understand and reach Brahman, the Reality in us. Composed by Sri Adi Shankaracharya, Vivekachudamani is in the form of a dialogue between the student and the Teacher, with the latter guiding the former along the spiritual path. Swami Tejomayananda’s discourses is the perfect companion for students walking the spiritual path in understanding its timeless wisdom. This exposition is on the first half of Vivekachudamani covering the first 250 verses by Pujya Guruji Swami Tejomayananda that was covered in a unique camp at Sidhbari, Himachal Pradesh in 2017. Vedanta is truly the science of life. Sankara, the great interpreter of Vedanta, not only gave us his commentaries on the Upanishads, the Brahma Sutras and the Bhagavad Gita, but also composed many primary texts that introduce the seeker to the joys of Vedanta. One of the greatest texts he has written as an introduction to Vedanta is the Vivekachudamani, which means The Crest Jewel of Discrimination. Vivekachudamani is the cream of the Upanishads and the Bhagavad Gita. It re-educates the student in a systematic way to provide him with a new vision of life. The goal and the path are both exhaustively dealt with in this elaborate exposition of Vedanta by Sankara. Vivekachudamani contains all the guidance a sincere student needs to live a spiritual life and discover his true Self. 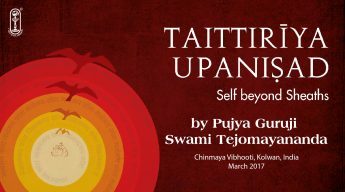 Pujya Guruji Swami Tejomayananda with his brilliance and wit gives a rational analysis of this sacred text, leading seekers to the knowledge and understanding of the true Self. 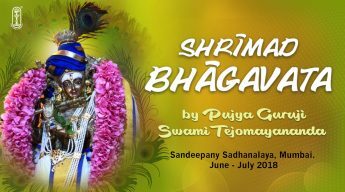 Through these videos, you will experience the warmth and love of great master sharing his wisdom and joy and pointing towards your own divinity to help you to discover the unlimited love and light within yourself.